Did you ever had to outline information on a report? For example, the user asks you to move this field a little to the left or right, or can that textbox be a little bigger because sometimes it’s just not big enough? Or can you also add this information into that textbox, but don’t change the outlining with the other rows because that would “mix-up” the borders? And ofcourse, this has to be acomplished in a complex document report containing a lot of information in a table with groupings, expressions, and so on. A solution might be to add a table2 in the textbox. A table can be added into another table, but not on Detail level. It’s only allowed on a Header, Footer or Group level. So, as shown in the above screenshot, you add a grouping and into that grouping you add a tabe. From the table you add, you then remove the Detail and Footer level, so only a Header level, with two textboxes remain. Now you can format each of these textboxes as you please. Merging cells can be done by selecting two cells, right click and in the contextmenu that opens, selecting “Merge cells“. Of course, to be able to do that, you first need to add an extra column and then merge all required cells, except those in the Group Header level, as in the above screenshot. Although this works, it can be a problem when in the future you want to delete or move column A or B, because that is not allowed when they contain merged cells. Another workaround is to work with our friend the Rectangle. 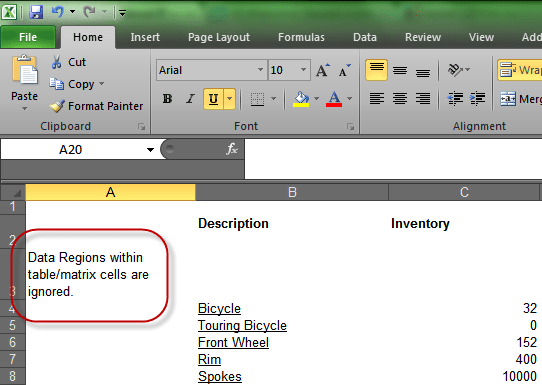 Drag a Rectangle from the toolbox onto the Body of your report. Insert two textboxes into the Rectangle. Cut and paste the Rectangle into the Table.